锦鱼人（Jinyu）是潘达利亚的一种形似鱼类的人形生物种族。锦鱼人是一个古老而智慧的种族，就连熊猫人也敬仰他们的智慧。 Masters of the water, they have been known to stick their staffs in rivers and literally hear what the land is saying. The waterspeakers are an upper caste, spiritual leaders that use the river to listen to the future. The jinyu originated from murlocs who were fortunate enough to live near the enchanted pools of the Vale of Eternal Blossoms. The magic of the pools expanded their minds and grew their bodies, until they became one of the great ancient cultures of 潘达利亚. In the days before the 大分裂, legend has it that all rivers flowed to Pandaria. Few were more aware of this than the clever jinyu. Over time the wisest of their people learned to commune with the waters of the river and listen for the future and news it would bring. These elders were respected by most races and earned their title of "Waterspeakers". In time a jinyu empire emerged, ruling all of Pandaria from the Vale of Eternal Blossoms. In the years before 雷神's rise to power, the mogu clashed against the other races of Pandaria. The mogu fought against the jinyu empire in a battle that lasted forty days and forty nights. The power of the jinyu waterspeakers nearly defeated the mogu, but at the last moment they were slain by an unknown mogu foot soldier, who hurled the jinyu's own fishing spears back at them, piercing the waterspeakers' shields and deciding the battle. After this, the jinyu resistance ended. During the reign of mogu emperor Lei Shen, the mogu invaded the jinyu kingdoms and slaughtered all who opposed them. Afterwards, the jinyu were enslaved along with the other mortal races of Pandaria. The jinyu took part in the pandaren revolution, listening to the waters to divine where the mogu would first respond when the rebellion started. After the revolution, they apparently swore allegiance to the pandaren emperors. The jinyu have been at war with the hozen for a very long time. Many thousand years ago, the Pearlfin Tribe stood on the throne of all Pandaria. At some point the hozen approached them for help; the jinyu felt sorry for them and taught them how to survive. The jinyu gave them their trust, but over time the hozen grew strong and bold and began taking the land for their own , leading them to betray the ones that had helped them. Over time the jinyu experienced a waning of their numbers and influence, with Pearlfin Village now all that is left of their people. The jinyu appear to blame the hozen for the fall of their people, and have been distrustful of outsiders and at war with the hozen ever since. Facing the hozen's "dirty guerilla tactics", the jinyu are outwitted by the hozen at every turn. 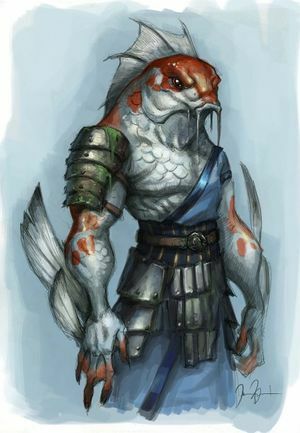 The hozen are vastly superior on land, especially in areas with thick tree cover, but the jinyu have a strong advantage on or near water, allowing them to defend Pearlfin Village. The jinyu consider the hozen "careless, filthy beasts". 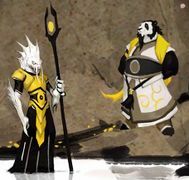 History regarding the Pearlfin's betrayal by the hozen is patchy, and both its exact timeframe, and its possible involvement with events such as the subjugation of the jinyu by the mogu, are unclear. It is possible that the betrayal took place prior to the fall of the jinyu empire, weakening the empire and thus being blamed for its eventual fall to the mogu. Alternatively, the Pearlfin may have ruled far more recently as part of the 熊猫人帝国. In addition, the betrayal may or may not have been involved in the jinyu's fall from power; it may simply be held the cause for the subsequent diminishing and destruction of their people, and have taken place long after the jinyu had ceased to rule over Pandaria. Alliance adventurers encounter a jinyu named Bold Karasshi and enlist his aid in rescuing Admiral Taylor from a hozen prison. After escaping their captors, the Alliance and jinyu prisoners seek sancturary in Pearlfin Village, home of the Pearlfin tribe. After discovering that the 部落 has allied with the hozen, the Alliance group attempts to recruit the jinyu into the Alliance. After consulting with their water spirits and the spirit of the former jinyu emperor of Pandaria, Rassharom, the Pearlfin jinyu agree to ally themselves with the Alliance. The Alliance group train the Pearlfin in their superior military knowledge and arm them with weaponry. In exchange, the Pearlfin pledge their support in the Alliance's war against the Horde. Pandaria is surrounded by and shot through with clear blue waters, and it is in these bodies of water that the amphibious jinyu flourish. In a sense, the jinyu maintain and cultivate natural water sources, even creating smaller streams with elemental magic. But the jinyu also exercise a dominion over Pandaria's rivers and lakes that can bring them into conflict with other races. They regularly stop up rivers to create their homes and breeding pools, and the multifaceted dwellings they create aren't simple mud lodges – they are towns and camps that can extend beneath the water. Jinyu society is caste-based. Jinyu are chosen for their roles (such as warriors or priests) at a young age, and final say in all communal decisions is granted to the elder jinyu in a tribe. While this rigid structure can seem constricting, the elders' roles are often deserved: they can speak and listen to the waters that flow throughout Pandaria, making them extremely wise and terribly powerful. Eggs are sorted early on based on the needs of the community. Many jinyu are cast as workers, diligently put to work building dams or other structures. Others are selected to be craftsmen, and immediately undergo a rigid apprenticeship on hatching. Only warriors and priests are given access to the most food and findest shelters, and only the most successful of priests can ascend to the role of elder or waterspeaker. It is a taboo for the jinyu castes to intermingle. Jinyu pray over heirlooms or tokens of their dead in order to properly lay them to rest, and move on. Jinyu assassins employ the ashwing moth as both a portable decoy and a light source to reveal weak spots in their enemy's armor. Unlike the fire and heat forges of the 熊猫人 and mogu, the jinyu have mastered the art of water forging. They shape stone and metal by using the pressures and currents of water. Originally they would scavange for polished stone and materials in the river. They developed an eye for the places that would provide the best quality baubles and rocks. Over the ages they have learned to manipulate water through their magics to craft exceptional edifices of the rock and stone that defy rivalry. Their weapons and armor are as hard as any forged steel, and their walls often appear to be constructed without seams. Water striders serve an important role in Jinyu culture, acting as mounts, a means of sending communications, and even family pets. It was initially stated during the panel that the Alliance would try to befriend the hozu (now renamed hozen). This was eventually clarified in a press tour, which stated the Alliance would indeed befriend the jinyu, and the Horde the hozu. 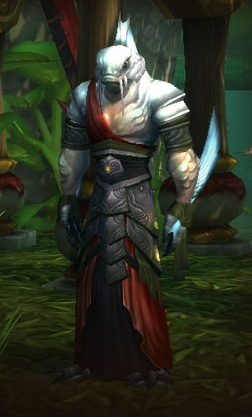 Their current in-game model uses the night elf male skeleton for a base. Hozen skulls are prized tokens among the jinyu. They use them to perform ceremonial rites, and the older the skull, the more potent its magic. Resourcefulness is a trait admired by the jinyu. A waterspeaker speaking with 少昊. The jinyu may have been inspired by the Zora from Nintendo's The Legend of Zelda series as they bear a strong resemblance. ↑ 5.0 5.1 Mists of Pandaria Press Tour. MMO-Champion (2012-03-19). Retrieved on 2012-03-19.